Chewing gum is the world’s most common habit. 1.6 million pieces of gum are sold every hour. Whether you’re a chewer or not, the amount of gum being consumed is a shared concern for us all. One piece of gum takes up to five years to biodegrade and costs Europeans £2 ($3.45 CAD!) on average to remove from surfaces and streets. Fortunately, there is a company in the UK that is turning a sticky situation into an opportunity. 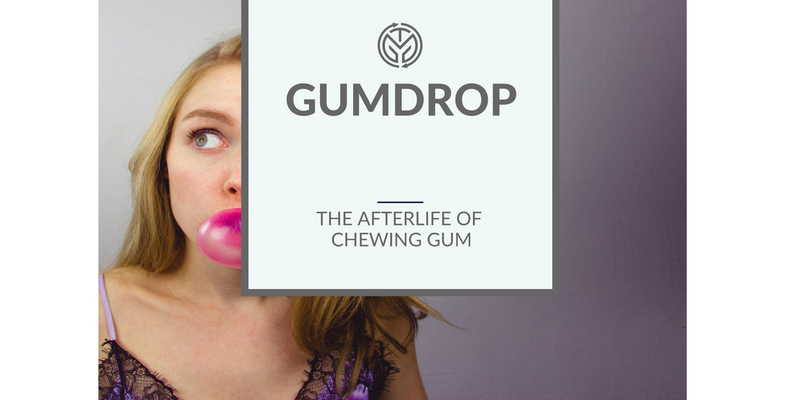 Gumdrop Ltd.’s mission is to tackle the global problem of chewing gum litter. Chewing gum has upcycling potential. Its basic ingredient is similar to plastic and is used to create a variety of new compounds. Check out the first shoe ever made with chewing gum with the use of Gum-tec® components! Anna Bullus, owner and founder, created Gumdrop Bins and the Gumdrop On-The-Go in order to collect used gum output and repurpose it into useful objects. The company aims to take something simple — collecting used gum — and turn it into big changes for our environment. Gumdrop continuously expands into global markets by partnering with a variety of companies who similarly believe that ‘The future’s green – with a drop of pink’. Gumdrop helps solidify the lesson that there are better ways to dispose of and recycle your chewing gum. It’s also another great example of how changing something small — literally one piece of gum at a time — can have a major impact on the environment. Right now, Gumdrop is only in Europe, but the company is always looking for new collaborations and sponsorship to help raise awareness and expand their reach. It’s important to support and commend companies like Gumdrop who are pursuing innovative ways to take closed-loop recycling to the next level.